Based on detailed EBSD analyses, Kurtuldu et al. (Acta Mater. 70:240–248, 2014) have explained the grain refinement of Au-12.5 wt pctCu-12.5 wt pctAg (yellow gold) by the addition of minute amounts of Ir in terms of “icosahedral quasicrystal (iQC)-mediated nucleation”, i.e., Ir induced the formation of Icosahedral short range order (ISRO) of atoms in the liquid, leading to the formation of iQC on which the fcc-phase forms. In the present contribution, we show that: (i) this mechanism is also responsible of the grain refinement in Au-20.5 wt pctCu-4.5 wt pctAg (pink gold) with Ir addition; (ii) ISRO also influences the morphology and growth kinetics of the fcc phase: at solidification rate of a few mm/s, \(\langle 100\rangle \) dendrites are replaced by a cellular-type morphology growing along \(\langle 111\rangle \) when 100 wt ppm of Ir is added to the melt; (iii) iQC-mediated nucleation is accompanied by a spinodal decomposition of the liquid, which is revealed at high cooling rate by the formation of Cu-rich particles or dendrites, some of them being also twinned, in parallel to iQC-mediated grain refinement and twin formation. 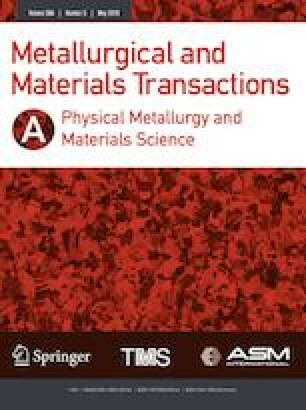 The authors would like to thank Dr. S. Prades-Rödel and Dr. A. Blatter at PX Group for providing the gold alloys. J.Z. would like to thank E. Etienne for sample preparation. Y. Amal, E. Delon, D. Lacueva Oyarzabala and A. Masson are also acknowledged for their help with heat treatments and associated characterisations. Au-Ir binary phase diagram. http://ipandat.computherm.com/Diagram/Details/7556, 2017. Accessed 12 September 2017.